Theatre Eddys: "You for Me for You"
"You for Me for You"
The driven desire against immense odds to escape despot regimes where personal freedoms are few-to-none, food is scarce to the point of hunger, and family members are often at risk of being whisked away in the middle of the night is certainly a part of our current, global consciousness. Every day we read or watch clips of refugees fleeing across dangerous borders and waters to countries that may or may not welcome them – our own country now being among the latter group of countries shunning many refugees. What we may sometimes overlook is how excruciatingly difficult that initial decision to leave actually is – no matter how deplorable are the conditions – and how retching it is to family members who find themselves separated, a pain that never goes away. 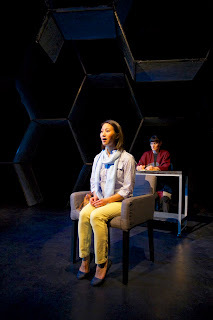 In her 2012 play that premiered at Wooly Mammoth in Washington, D.C., You for Me for You, Mia Chung employs fantastical elements, humor, time/space fast-forwards and flashbacks, and a number of symbols and metaphors to provide a sometimes searing, sometimes confusing look at the refugee’s experience – both from the perspective of making it across the border and from being the one left behind. Crowded Fire Theater presents an imaginative version of You for Me for You at the intimate Potrero Stage (formerly, Thick House), with impressive production values and a fine cast. Under the creative direction of M. Graham Smith, this rendition is so nonlinear and jumbled at times in its references, reversals, and dream-like sequences as to leave the audience in a final state of blur as to what really happened. In fact, Junhee soon successfully finds herself in front of an immigration officer to get into the U.S. while Minhee is swallowed into the bottom of a dry well before she can make it across the border. There, she is left to hover in darkness, fear, hunger, and regret. The bulk of the play’s one hundred minutes is then devoted to the experiences of Junhee’s assimilation to become an American and to Minhee’s memories and hallucinations (or at least, that is what I interpret them as) of her search for her lost son and husband. Throughout, the play never lets us forget the unresolved pain of the two sisters’ separation nor the power of their love for each other. Both Grace Ng and Kathryn Han leave memory-lasting images in their singular, sensitive, and often searing portrayals of Junhee and Minhee, respectively. Ms. Han’s Minhee is at first calmly self-controlled in her near-slow-motion reactions to her own desperate situations. All that changes as she begins her mind-driven, panicked searches in often strange, non sequitur sequences for her young son lost to one of the regime’s notorious reeducation camps and for a husband who supposedly sacrificed the son for his own political ladder-climbing. Ms. Han displays an impressively wide range of emotions from quietly lost and resigned to frantically determined and bravely assertive as the mother-wife-sister left in a hell with nothing but her fantasies. The play’s script alternates many times between scenes of Minhee’s dreams and Junhee’s first few years after arriving in New York where the need for scenes to be parallel in actual time plays no part. Grace Ng’s Junhee provides an informative and plausible face to Every Immigrant in modern-day America as she maneuvers from job to job – steadily, step-by-step figuring out and beginning to thrive in the American experience of frozen yoghurt shops, baseball games, and stores full of goods of every imaginable sort. She gradually transforms from the silent, nodding, and rarely understanding just-arrived to the now-knowing, much-assimilated persons we pass every day on the street whose amazing, background stories of suffering and survival are no longer outwardly readable. Junhee along the way meets a different sort of immigrant, an African-American man just arrived in NYC from Alabama -- a happy, easy-going, highly likable Julian Green whose unnamed Man is ever persistent in his patient and persistent pursuit of the shy Junhee. The immigrant’s experience is particularly illustrated though Liz, an ever-changing character who shows up in Junhee’s immigration journey in roles such as border processor, fast-food cashier, patient in hospital, and hospital personnel manager. Elissa Beth Stebbins is award-deserving for her several cameo appearances. Her speech is first heard by Junhee as a jumble-mumble of nonsensical syllables, later as a mix of words arranged in an order not making sense (and punctuated by more nonsense sounds), and increasingly with each new role finally progressing to full, understandable speech. Her performance is perhaps the best example of what it must be like to arrive not knowing a language and immediately thrust into daily motions of shopping, working on a first job, and trying to discover the norms of a new culture. Jomar Tagatac takes on a number of varied, North-Korean-based roles ranging from a cartoon-like doctor to a money-hungry smuggler who has a change of heart to the lost husband of Minhee (among a number of other roles). It is as this final part that he is particularly powerful as he describes to his wife the tortuous journey toward his own demise – all the time as tears and mucous flow from his eyes and nose. Jomar Tagatac, Kathryn Han & "Bear"
Watching Mia Chung’s play means having a high tolerance for letting scenes float by and either letting go of the ones that do not always make a lot of logical sense or just accepting that ambiguity is the desired norm. We are not given a lot of clues how to interpret, for example, a smiling, Yogi-like bear that repeatedly appears in some scenes. We never quite know if we are watching what actually happens to Minhee or what she is remembering in a fevered dream or what she wishes in her mind would happen as she drifts into a hungered stupor. And as the play draws to its climax, events become even more hazy as to what has been real and what has just happened and why. But in any case, there is no argument that David K.H. Elliott has created a lighting design and James Ard a sound design that are both stellar in the telling of these often-surreal sequences. 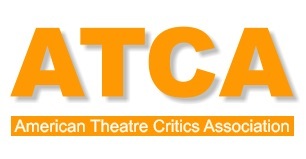 Each has out-performed for a theatre as small as the space before us, and their ingenuity enhances the overall experience immensely. Lynne Sofer’s contributions as dialect coach certainly pay off for each of the actors, from the drawling Man from the South to the incredible verbal acrobatics of Liz to the Korean accents which sound very authentic to the untrained ear. 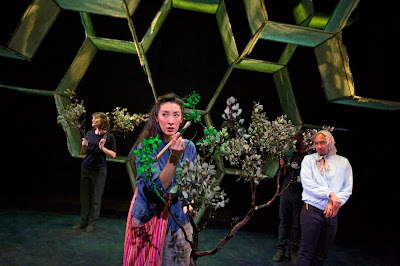 Maya Linke’s most visible element of the scenic design (a large cellular model in the background ... or is it a honeycomb?) is part of the play’s unexplained, mysterious symbolism, but her other elements of the many changing scenes easily flow in and out and work beautifully (as also do Michelle Mulholland’s costumes). Leaving behind the necessity to understand what occurred and did not occur in some realm of reality, the audience viewer of Crowded Fire’s You for Me for You certainly leaves with renewed impressions of the would-be and actual immigrant experience from countries much different in culture, safety, and independence than ours. 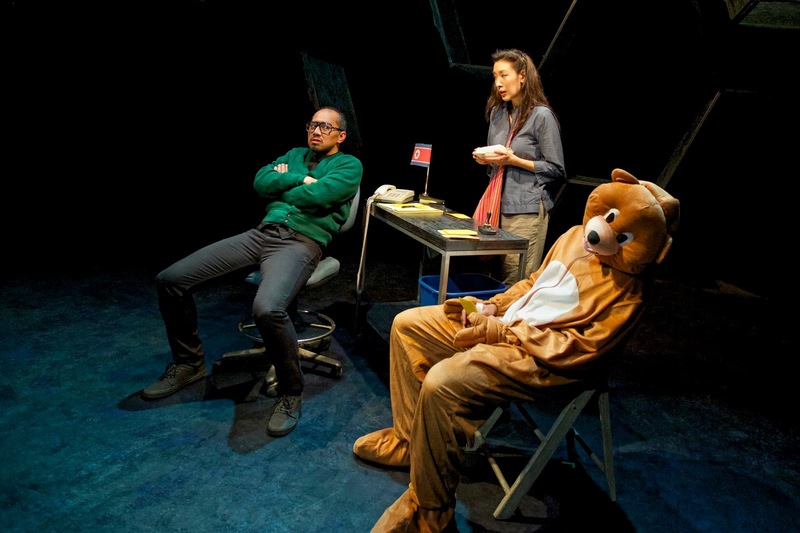 And in this day and time, that in itself is certainly a major accomplishment and a key reason to see Mia Chung’s freewheeling, often puzzling, but always intriguing play. You for Me for You continues through April 1, 2017 as a Crowded Fire Production at Potrero Stage, 1695 18th Street, San Francisco. Tickets are available online at http://www.crowdedfire.org/.